Cuban accounting professor, private business consultant and revolution supporter Kariel Gonzalez in Havana. HAVANA – In a eulogy last week in Havana for his brother Fidel Castro, Cuban President Raúl Castro often saluted los jóvenes – young people. But it couldn’t hide the fact that communist Cuba is still run by much older people. Like Raúl, who’s 85. Raúl has pushed limited economic reforms. But until he and his comrades known as “los históricos” are gone, deeper change in Cuba is likely to be slow – as Cubans like Kariel González are all too aware. “We have to change. We have to evolve,” says González, a 35-year-old accounting professor at the University of Havana. González also consults the same private Cuban entrepreneurs the U.S. is trying to promote. But he’s not a Cuban dissident – far from it. “I support the revolution,” he says, referring to the regime Fidel Castro founded 57 years ago. Last week, like millions of other Cubans, González went out to mourn Fidel Castro, who died Nov. 25, and he praised what he called the revolution’s social achievements. He was angry that Cuban-Americans in Miami celebrated Fidel’s death. González belongs to a large cadre of Cubans, mostly but not all millennials, who support the revolution and reform. Conservative communists in Havana and conservative anti-communists in Miami view them with suspicion. And they’re often accused of wanting it both ways – of too conveniently separating Fidel’s lofty socialist ideals from his brutal communist realities. But they’re also a key bridge on the island. They can speak to the dire need for democratic change – and to the rigid leadership that pulls the levers. Cubans like him feel especially anxious right now. In Cuba, Fidel’s death may prompt los históricos to become more hard-line. In the U.S., President-elect Donald Trump has pledged to cut off renewed relations with Cuba until Cuba produces more political change. Many other reform-minded Cubans agree. Like Caridad Limonta. The revolution allowed Limonta’s Afro-Cuban mother to work her way up from a hospital janitor to a registered nurse. Limonta became an economist – and one of the first female vice ministers of small industry in Cuba. But then, five years ago, Raúl Castro opened the door wider to private entrepreneurship. 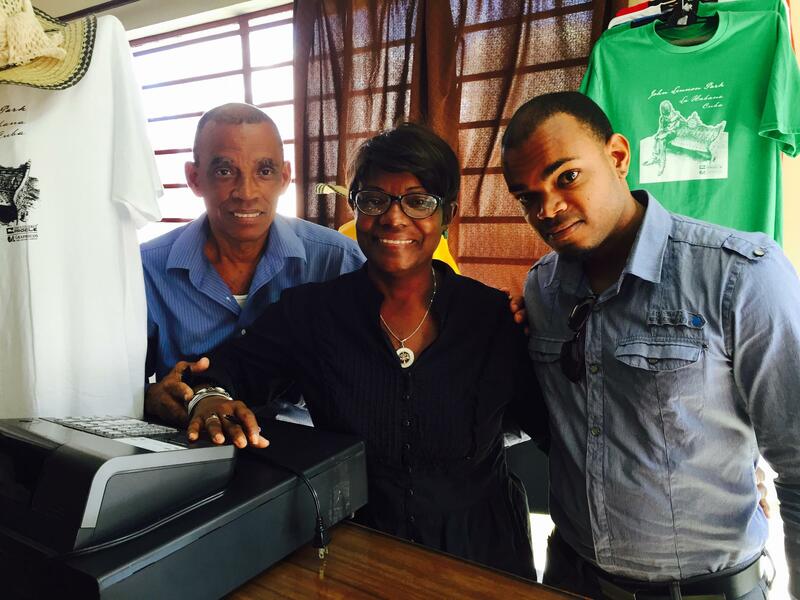 Limonta quit the government and started a successful clothing business called Procle – largely because, having seen Cuba’s economic paralysis up close, she considers this Cuba’s future. Caridad Limonta (center) with her son Oscar Matienzo (right) and husband Jesus Matienzo at their Havana clothing business, Procle. Equally, she can’t understand why Trump would reverse U.S.-Cuba normalization. “Why would he want to asphyxiate Cubans like me?” Limonta asks. Limonta’s son, 25-year-old Oscar Matienzo, is her marketing man. Last summer he attended an entrepreneur program at Florida International University in Miami. Matienzo, too, says that between Trump's rise and Fidel’s demise, his generation feels as if it’s in a precarious limbo right now. But chances are, both the regime and Trump will keep Cuba’s political and economic advancement on hold – at least until Raúl Castro leaves the presidency in about two years, most Cubans predict. “After 2018 I think we’re going to see real changes,” says González. If those real changes don’t happen, keep in mind the earliest Trump is slated to leave the U.S. presidency is 2021. Miami-Havana 'Connection' At Risk: After Fidel, U.S.-Cuba Ties Grounded Again? HAVANA - When the first commercial flight between the U.S. and Cuba in more than half a century touched down in Santa Clara in August, the JetBlue plane from Fort Lauderdale was met with cheers and water-cannon salutes. When the first commercial flight between Miami and Havana in more than half a century landed at José Martí International Airport Monday morning, the American Airlines 737 taxied quietly to the terminal and unloaded 125 passengers wearing complimentary straw fedoras. No confetti. No music. And it felt remarkably fitting. Next month marks the second anniversary of normalized relations between the U.S. and Cuba – and things couldn’t look more uncertain. President-elect Donald Trump has pledged to cancel normalization unless Cuba delivers more democratic reform. But even before Trump’s election, Cuba seemed to be closing rather than opening the door to U.S. business. HAVANA - While Miami mostly celebrated Fidel Castro’s death, in Havana the mood is much more somber – nine days of duelo, or mourning. HAVANA - Hundreds of thousands of Cubans filled Havana’s Revolution Square Tuesday night to bid farewell to Fidel Castro, who died Friday. We can’t know how many of them will actually miss the communist leader. But some of the mourners are not who you’d expect. MATANZAS – A caravan carrying Fidel Castro’s ashes is moving across Cuba from Havana to Santiago on the island’s eastern tip – marking a funereal return to where the Cuban Revolution was born.